Dr. Aisha L. Abdullahi, Commissioner for Political Affairs on 28 January 2014 briefed the press at the AU headquarters in Addis Ababa, Ethiopia on the different achievements by her department. She started by acknowledging the importance of the media as useful partners of the AU Commission in raising awareness on the activities of the Union. “We perceive the media in two important ways: first as the mirror through which we measure how we are performing as we strive towards the vision of an integrated, prosperous and peaceful Africa driven by its own citizens and representing a dynamic force in the global arena, secondly, as one of the various vehicles through which this noble vision can be pursued in the spirit of Pan-Africanism and African Renaissance”, she said. 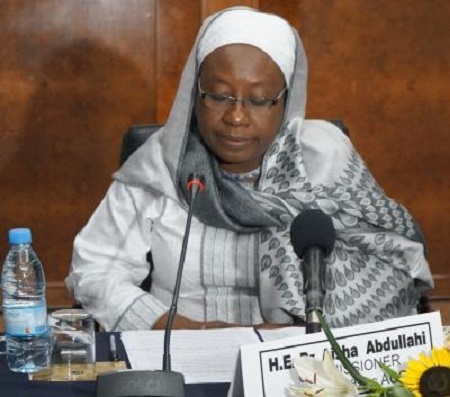 Focusing on the Africa’s democratization record within the framework of the African Governance Architecture (AGA), Commissioner Aisha Abdullahi explained that, the AGA is designed as a complementary framework to the Africa Peace and Security Architecture (APSA). It is conceived as the overall political and institutional framework for the promotion, protection and sustenance of democracy, governance and human rights in Africa. She said AGA is the comprehensive, overarching and consolidated framework for addressing issues of governance and governance related challenges aimed at addressing structural causes of political instability and crisis through inter alia, preventive diplomacy, mediation, negotiated settlement of conflicts, humanitarian assistance and durable solutions, reconciliation and post-conflict reconstruction and development. “This thinking is firmly rooted in the 2014 – 2017 Strategic Plan of the African Union which has prioritised the promotion of peace and stability, good governance, democracy and human rights as foundations for development and stable societies. “It is also inspired by the AU Agenda 2063-our long-term development vision. In the long term, the AGA strategy resonates with the African Union Agenda 2063. Anchored on the quest for Pan-Africanism and African Renaissance, the vision for 2063 is of an Africa that is at peace with itself, secure, corruption-free encompassing democratic and properly governed states run by efficient and effective public service institutions. A continent, where gender equality, youth empowerment, respect for minority rights and climate resilience will be the norm. “It will be a continent that is capable of mobilizing its own financial resources and not reliant on external aid. It will be an Africa that influences and drives growth elsewhere on the globe. It will be an Africa that plays its rightful role in global affairs including governance reforms of major international institutions, such as the United Nations, the World Bank and the International Monetary Fund”. The Commissioner added that, through the AGA, the Union seeks to facilitate implementation, support and compliment efforts by Member States to achieve their commitments under article 3 of the AU Constitutive Act and other relevant AU pronouncements. These commitments permeate various policy pronouncements (Conventions, Protocol, Charters and Treaties) at the regional and continental level. These commitments amongst others include: human rights and the rule of law, popular participation, accountability and transparency, strong democratic institutions, anti-corruption; improved service delivery ; credible and democratic elections, durable solutions to humanitarian crises and free movement of African citizens across borders of AU member states. The Commissioner finally presented the vision, missions and objectives of her department in view to insuring an integrated, peaceful and democratically governed Africa driven by its citizens and playing a pivotal role in global political and economic diplomacy. (See complete press statement of the Commissioner on the AU website: http://www.au.int ).